here you'll find space, restaurant, cafe and bookshop. Lrge glass walls and iron framing, giving it an industrial feel and outside there's large grassy area and big Bodhi tree. 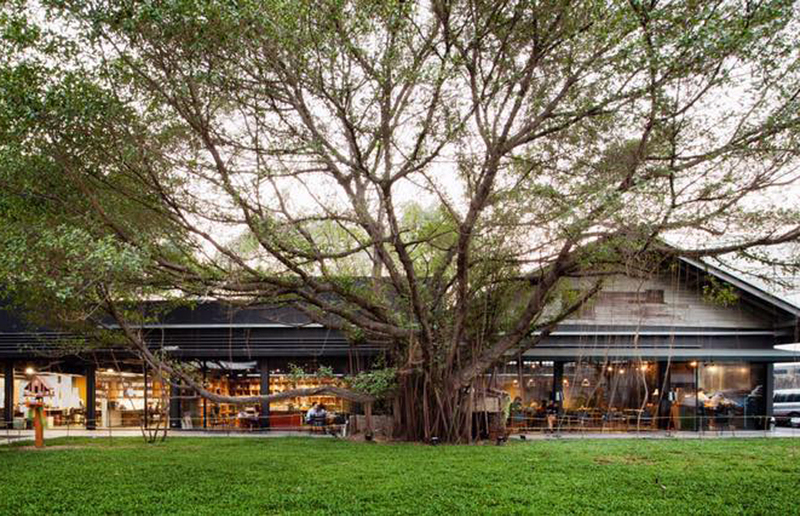 There are very few places in Bangkok where you can go and truly let out a sigh of relief. Picture this: a series of old factory buildings wrapped around a grassy courtyard, massive Bodhi trees and a deck leading to the river’s edge. This place can be get very busy on weekends, the bookshop doubles as a cafe and there are books in English, Thai and a few in Chinese. The restaurant sells home décor and there is a smaller room with furniture for sale.